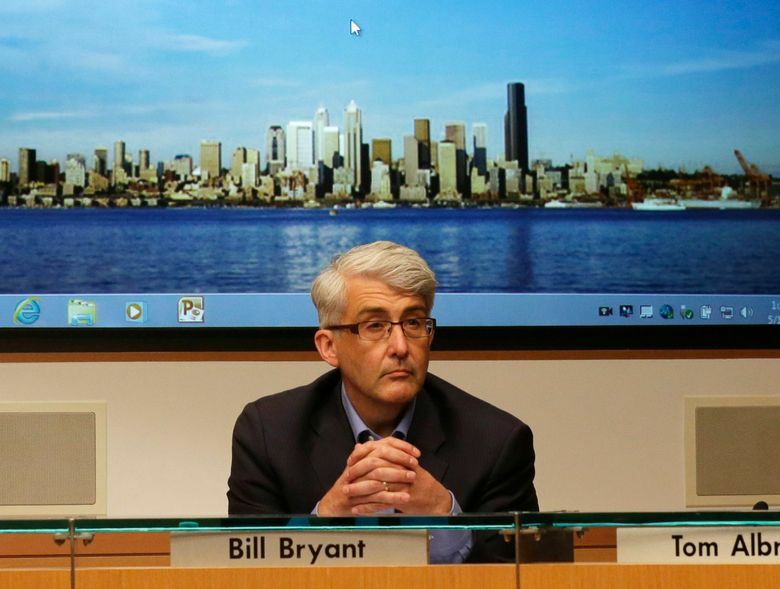 Republican Bill Bryant, a Port of Seattle commissioner, says he’ll challenge Democratic Gov. Jay Inslee in 2016. Port of Seattle Commissioner Bill Bryant launched a bid for governor Thursday, becoming the first significant Republican challenger to Democratic Gov. Jay Inslee in 2016. His ambitions for higher office come amid a major controversy at his current job — the legal and political fight over Shell oil rigs docking along Seattle’s waterfront in preparation for drilling off Alaska’s North Slope. This week, Bryant was the only port commissioner to vote against asking Shell to delay the arrival of its vessels. Even as Bryant’s campaign went live, the Polar Pioneer, the first of those oil rigs, arrived in Elliott Bay on Thursday afternoon, greeted by protesters in kayaks. Despite approval by the Obama administration of the Arctic drilling, environmentalists argue Seattle should not be complicit in oil extraction that will worsen global climate change. They have hotly opposed the port’s Terminal lease with Foss Maritime, Shell’s contractor. But Bryant’s support of the Shell deal has angered environmental groups, including Washington Conservation Voters (WCV), which endorsed his 2011 re-election campaign. Shannon Murphy, WCV’s president, slammed the “ironic” timing of Bryant’s announcement, and mocked his talk of caring for Puget Sound. “His actions today show that’s just rhetoric for him,” she said. WCV is a major ally of the Democratic Party and spent heavily to elect Inslee in 2012. Alex Hays, a spokesman for the Bryant campaign, called the Shell fight “entirely symbolic” and defended the port’s environmental record. “We reject this false choice between the environment and jobs,” he said. A port commissioner since 2008, Bryant is also chairman of Bryant Christie, a firm he founded in 1992 that helps companies market and sell products overseas. On his website, he boasted of working to cut port carbon emissions and on the recently announced alliance between the ports of Seattle and Tacoma. Bryant, 54, who lives in Seattle, did not make himself available for interviews Thursday. He has been mulling a bid for higher office for years and has been traveling the state extensively to raise his profile. More than two dozen state House Republican lawmakers signed a letter this week urging Bryant to run. The letter criticized Inslee for a “hyperpartisan, divisive style” and said Bryant would bring “unifying, pragmatic leadership” to the state capitol. As a relatively obscure elected official, Bryant’s first obstacle will be introducing himself to potential supporters. He’s positioning himself as a political moderate, citing former President Theodore Roosevelt, famously a conservationist, as his hero. In a statement, Jamal Raad, spokesman for the state Democratic Party, criticized Bryant’s past donations to “deeply conservative” Republicans including former President George W. Bush. Working Washington, a labor-backed group, also hit Bryant for opposing its efforts to raise pay for workers at Seattle-Tacoma International Airport. Other Republicans are likely to join the 2016 fray in the coming months. GOP insiders have pointed to state Sens. Andy Hill, R-Redmond, and Steve Litzow, R-Mercer Island, as potential contenders, along with Republican Congressman Dave Reichert. Along with Bryant, those potential rivals are scheduled to speak this weekend at the annual conference of the Mainstream Republicans of Washington in Leavenworth, Chelan County. With populous King County growing into a solidly Democratic stronghold, the GOP has lost eight straight gubernatorial races going back to 1984 — the longest such losing streak in the nation for the party. Bryant’s announcement downplayed his Republican affiliation, which was listed only as small-type ‘R’ at the bottom of his campaign website. In his video, he said the campaign shouldn’t be about Republicans versus Democrats. “My agenda isn’t ideological. It’s not partisan,” Bryant said.